Maurizio Sarri’s job potentially rests on Chelsea’s Europa League tie with Malmo as the competition is now seen as a realistic route into the Champions League. Owner Roman Abramovich wants to be back among Europe’s elite clubs but the Blues fear missing out on a top-four finish in the Premier League. 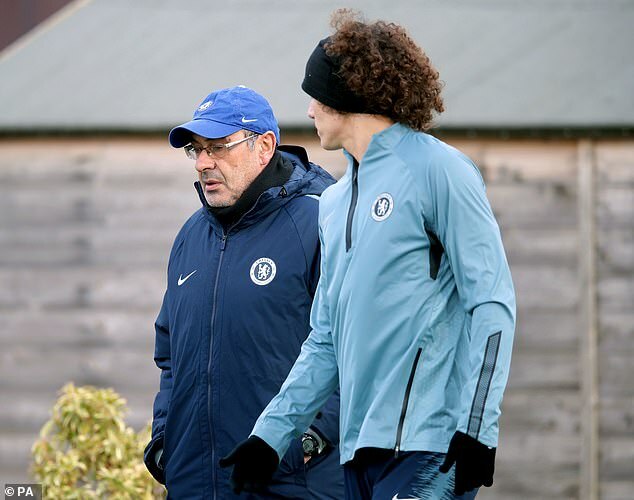 Sarri walked out alongside David Luiz for their open training session at Cobham on Wednesday before the squad’s journey to Sweden to face Malmo on Thursday. The Italian is expected to field a strong starting line-up, including Eden Hazard, as Chelsea look to bounce back from their 6-0 loss to Manchester City. Callum Hudson-Odoi may also be handed a rare start and he took part in a practice match on Wednesday, playing in the same team as Jorginho and Luiz. Ethan Ampadu could be seen featuring for the opposition side wearing bibs and he seemed to be playing in the Jorginho position in midfield. Wednesday’s session started with one-touch passing drills, overseen by Sarri. Danny Drinkwater was absent with a minor tendon injury and will miss the trip to Malmo. Amid concerns over a lack of leaders in the squad, one of the first players out was Gary Cahill, the club captain who came close to leaving on January. He stayed but his contract expires at the end of this season. Cahill’s last appearance was in the Europa League in November. The second leg of the tie against Malmo will be at Stamford Bridge on February 21.